Lamb Prices have crash this year and are down 30% on last year and reached the lowest price in six years. The supermarket prices don't reflect this though and their prices are only down by 6%. To put that into what you pay in the supermarket its £13 per kg compared to the farmer receiving £1.36 per kg. Someone is making a lot of money somewhere without putting in any of the effort and as anyone who keeps sheep will tell you there is a fair bit of effort involved! So from the 1st of August to the 7th across England there is a #NoLambWeek being staged. It's not going to change the world but it is a statement, hopefully farmers will stand together and not sell any lambs during the first week of August. It turns out to be a bad year to get back into keeping sheep! Saturday evening, after work, I moved the sheep. I had planned on doing it Sunday but the forecast look awful so I decided that doing it at 9 on a Saturday night was better than doing it in the rain! I've moved them all onto my smallest field. The plan being that they'll eat this off and get the field fairly bare within a week or so. I'll then separate out the lambs to wean them. The lambs will go off to another field with loads of grass and the ewes will stay on the bare field, having minimal food will allow them to dry off, hopefully without getting mastitis in the process. Doing this will mean I then start to sell the lambs to try and bring some money back in off them (instead of it going out) and then I can think about getting the ewes into condition for tupping - I also need to buy a tup fairly soon as well! This is a very picture heavy post! Mum has finally opened her garden to some local gardening clubs and the NGS next year. She has worked on the same garden for over thirty years, although it has taken many forms in that time. When my brother, sister and I were young she used to grow much more vegetables and we had a big lawn to play on with swings and even the climbing frame that our primary school chucked out as they deemed it unsafe! Now the garden is divided up into different areas, with two ponds, a stream, BBQ area, raised beds, parterre, even an area for the grandchildren with a sandpit and a veg bed for them to grow things in. The fencing I put up earlier this year - looks really lovely with things growing up it now. The Brick garden shed that took a few years to build and finish - finished it last year but started it about 3 years ago! The stream - mum added this some years ago and everyone who sees it thinks it's natural! I got married to my beautiful wife. I've been working in the village this week and where I've been working they've had a mobile saw mill in to cut up a collection of fallen trees they've got. One is a massive seqouyah they had to fell last year as it had died and was becoming unsafe. The tree is huge so they had to first cut it up with a chainsaw mill before moving on to the diesel driven bandsaw mill. The boards don't make very good structural timber but it does make great stable cladding. It's interesting to see how they approach milling these trees and how much wood they can get out of each one. After three days they've pretty much got through the large number of trees they had collected over the last few years on the estate, such a better use than logging it for fire wood. Some of the timber stored drying. I'm quite jealous of their stack of timber and what they can do with it all, in fact I'm planning on buying some Sequoyah from them to use as cladding on a project I'm planning. Seeing these guys in operation makes me think that many more people should re evaluate what they do with fallen trees and they shouldn't just see it as fire wood. It means a long term investment as you have to pay to mill the wood years before you can use it, store it for years to dry it and then process it the other end, but you gain a much higher value product for your efforts. Who else has milled their fallen trees instead of cutting it up for firewood? I think that my wife and I have a lifestyle that's pretty fairly split. Sometimes we don't see each other that much but we both spend lots of time with our children, her job as a teacher has lots of holidays and my work fits well with part time work. The Summer is when I have a large block of time dedicated to work as my wife has six weeks off, this allows me to build my funds so my own living costs (fuel, etc) are taken care of and it helps towards some of the extras and unforeseen costs. This summer all my work is local, a large portion is in our village, working for a friend and the rest (my weekend work) is in the next town about four miles away. Both are really flexible so I can work different days and fit it around work here on the house and smallholding, to be honest I'd rather work a weekend and have a weekday off anyway as it's much quieter if we want to do anything. I've been putting up lots of stud work lately! I know I've said it before but I'm forever thankful of my trade. Not only does it save us money on work we do to the house but it also lends itself so well to part time work and it's flexibility has enabled us to live the way we want to. I get a fair wage and enjoy my work - can't ask for a lot more really. With the third child on the way I'm also keeping a look out for work next year, it'll be nice if I have some lined up ready for when the new baby comes, although it's a bit early to be looking really! Who else is glad they have the job they do? Last night I was hanging a little gate I'd made a couple of months back. It had been leaning up against the shed for all that time and as the girls weren't back when I got home from work I seized the moment and hung it. The reason being I need to get the small bottom field ready for the sheep as they're in desperate need of fresh grass but It has three gate ways and only one gate (well two now). This little gate fixed the hole into the orchard (which is pretty important to keep sheep free) and I already have a swinging gate onto the road, but the other gate might just have to be tied with baler twine for now. This was something I didn't want to do as it's the being of a slippery slope. 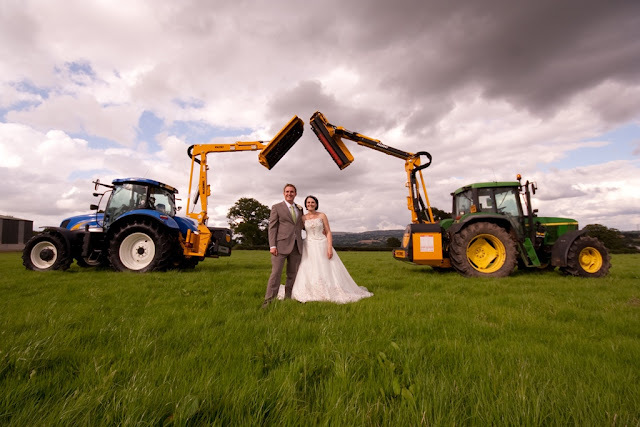 I grew up on a farm which had two swinging gates across all it''s fields, my childhood was spent jumping out of the Landrover or tractor to drag open the gate for my dad. Normally held in place with three bits of string and you had to leave it in a certain place or it would fall over. Sometimes when checking the sheep I would have to open three of these gates and close them again, it used to drive me mad. As the land was rented there was never a huge incentive for dad to hang them but I was always certain mine would all swing. Who else ties their gates with string and has to drag them open? Back at the beginning of May we had to spend a bit of time in hospital with my eldest daughter as she'd developed a limp. We had such support and nice messages from the blog I thought I'd give you all a little update on how things are going. Yesterday my daughter and I took a little trip to Birmingham children hospital to see a specialist for the second time. We tried to make it a little adventure for her as we really don't want her to dread visits to hospitals so a little bit of effort goes a long way. Her sister stayed with Grandma so it was just me and her and I decided we should get the train in (she loves trains almost as much as I hate using them), it was her first proper train ride and she was as good as gold and so excited. In fact a woman even stopped me to tell me how well behaved she was which was really nice! We had a picnic on the train and when we got to New Street Station (which is more like an airport than a train station) she stayed close to me, was really alert and not phased by it at all, bare in mind that we don't go anywhere built up very often as I try to steer clear of anything larger than our village! We then got a taxi (another first) to the hospital to go for an ultra sound on her joints. Here it showed she still has fluid on her hip joints but it's got slightly better. We then had to wait a little while to see the specialist who told us that the operation booked for Wednesday wasn't going to happen now (hurray!) as he's happy that things are getting better on their own. Before leaving we then had to do blood tests (which she hates and are horrible for a little person), But I tried to make up for it by going for a grown up meal afterwards (with ice cream!). Getting the train home I was reflecting on how lucky we are, this limp seems to sorting itself out now and when you go to a dedicated children's hospital it really puts things in perspective when you see other poorly children. Also I was so proud of my little girl, she's only three and a half but acted like a grown up all day, was really brave, I didn't have to tell her off at all and she was great company - we catted all day! She also reminds me so much of my wife in her temperament and demeanour that I can't help but smile at some of the things she does! We have to go back in four weeks time for another check up but we're hoping by then it'll almost be completely gone. A friend of mine is hatching some eggs using a broody chicken so I thought I'd do a quick post with some tips for success and then any anyone else has got can be added at the end. - Make sure she's been broody for at least a few day before you give her eggs to hatch. - Separate the hen off from the rest of the flock and get her settled for a day before you put eggs under her. - If you leave her in the same pen then the other hens might bully her off the nest or they might fight and an egg get damaged, although I know many people still hatch eggs without removing the chicken from the flock I just find it easy to manage as well. - Also use the day before to make sure she stays broody, sometimes moving her into a new pen will break her broodiness (annoying if you've brought eggs for her to sit on!). - Make sure the pen you give her is nice and safe from predators and has a nice dark nest for her to hide in. I use a little chicken arch for the purpose (or chicken tractor if you live on the other side of the pond) with some hay for her to build her nest with and a covered run. - When collecting your eggs to hatch out, the fresher the better, and better if they're all the same age. Make sure none are damaged. - Don't get too greedy on what your hen can hatch out. Look at the size of her and think about how many will comfortably fit under her. Lift her up and see how big of a warm area she has under her. I normally go for about 8 or nine eggs for an average sized chicken with normal sized eggs. - It takes on average 21 days for a egg to hatch but I have had eggs hatch on day 20 so it pays to keep checking towards the end. - It's worth candling the eggs halfway through to see if they're is any signs of development, a bad egg at the end can smell really bad! - Every day during the brooding I make sure the hen is chucked off her nest and shut out of the nest box for ten minutes. She doesn't like this but then she can then have a (huge) poo away from the nest and have a drink and some food. I give her constant access to food and water the rest of the time but at the far end of the run so she has to get up to eat. - A good hen will be dedicated to her eggs, if you see her eating and walking around lots you might as well take her eggs away as it's doubtful they will hatch. Also a good hen will be desperate to get back to her eggs after you've taken her off when she has a drink and some food. - When the eggs hatch the hen will really come into her own, she looks after the chicks, not you. You don't need to provide extra heat, just drinking water (with stones in to prevent drowning) and some chick crumbs for them to eat (they don't need any for the first 24 hours). I move mine on to fresh grass each day and after a few weeks I add a little wheat to their food mix to get them used to what they're going to eat. - This is when they're most vulnerable to predators so make sure they're coop is covered. When I hatched some out this year the magpies didn't leave the side of the pen for three weeks and I've no doubt I would have lost them if they weren't under wire. So there are a few of my tips. I know that free ranged chickens wonder off and come back with a clutch of chicks quite often but it's not a very planned way of hatching them and can be a little unreliable! Using a hen in this way really is, in my opinion, the easiest way to hatch out chicks simply because once they're hatched the hen looks after them for you and they harden up to the outside world much faster -without a incubator or heat lamp in sight! What are your top tips for hatching eggs? What Did My Wife Marry? I tell people that my wife new what she was getting into when she married me, but sometimes I think she didn't realise quite how far down this slippery slope I'd get! Full waterproofs at 6.30 this morning to get the sheep in. The main trouble is that my girls will grow up thinking this is normal! Dawn over at Doing It For Ourselves In Wales has just done a post on the woodlands that she's planting so it spurred me on to go and take some pictures of my coppice areas and how they're doing. The hybrid willow I planted for fuel last year (March 2014) is finally coming into it's own. It hardly made an appearance last year but now it's coming on strong. One is as tall as me and the others are around three foot tall. I'm pleased as I thought I might have to replant these areas as they grew so poorly last year, I guess they were just getting their roots established ready to battle the weeds this year! The rest of this batch are about 3ft high but there are lots in there so I'm quite pleased. My willow I planted for basket weaving is coming up quite well but looking at it I know I should have spent a little more money on the weed mating. It was falling apart as I was putting it down so I'm not sure what I was expecting. there are some good strong plants in there though so I'm still pleased. The rabbits seem to have left them alone as well which is always a bonus! The hybrid willow I planted this year isn't doing so well and I have only myself to blame. I made a critical error with it. I pegged the matting down, planted the willows, then just left it for a month or so. I think what happened was the wind would blow the matting up and down (this was before I added the wood chip) and it knocked the budds off the cuttings. A simple mistake that's cost me a lot of time to try to get these growing well again next year. It's not a total loss though as there are still plenty of them growing and looking okay but no the numbers that should be there. I'll have to keep my eye on them a little better in future and put the wood chip down straight away. The old willow we pollarded is coming back strong now, with loads of new growth, ideal if I had goats! I'll let this grow for a few years then cut it for firewood again. The bottom little coppice area (started in 2012) is looking a little more established. The trees hold their own now and there is a good mix in there, the Rowans (for berries) at the back are about 10ft high and the cherries (not for coppicing just for scion wood) are looking healthy. Even the purple filbert I planted has got some nuts on it - what's the betting Mr Squirrel has them before I do? The barberries I planted this year are doing well even though I haven't water them since I put them in! How are any trees you planted looking this year? Have you had many losses or made many mistakes like I have?